WhatsApp. 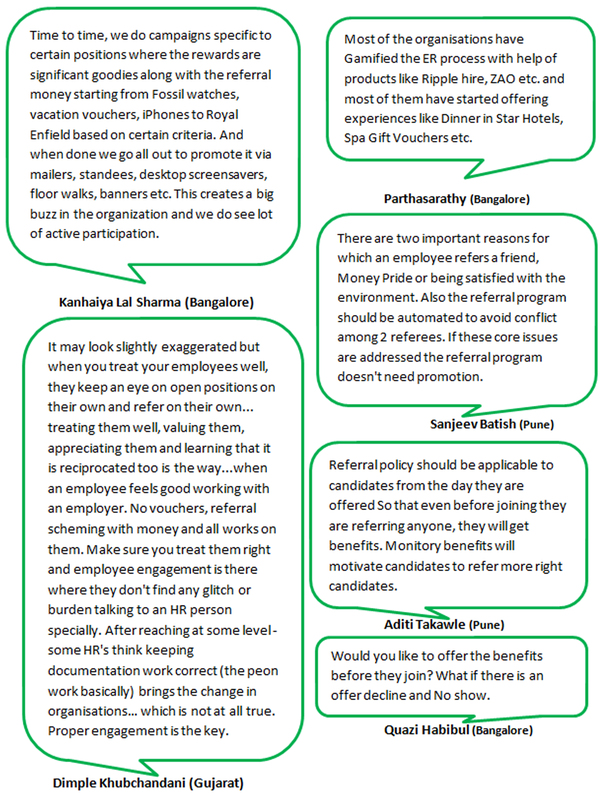 Group Chat – How to Create Awareness in Employees about Referral Programs in the organisation? Creating awareness in Employees about Referral Programs in the organisation is a task that is given little importance by Talent Acquisitionists. Therefore most Employees aren’t aware of the company’s referral programms. If creating awareness about these programs within your organisation’s Employees is difficult and are looking for ways or methods to build awareness then you’ve come to the right place. Have referral leagues for few months with lucrative gifts in the form of rewards apart from the referral bonus amount during that period. Send weekly mailers to all the employees containing information about the vacant positions with the referral amount details. If there are niche requirements then spread special referral e-mails with additions in the referral amount and highlight it within the e-mail. Conduct quick town halls where the company leaders can go to each ODC to talk about ER and the current vacant positions. Conduct small contests among the employees of that particular ODC to get the referral immediately and on the spot. Goodies along with the referral money starting from Fossil watches, vacation vouchers, iPhones to Royal Enfield based on certain criteria. Go all out to promote ER via mailers, standees, desktop screensavers, floor walks, banners etc. Create a Gamified ER process with the help of products like Ripple hire, ZAO etc. Offer experiences like Dinner in star hotels, Spa Gift Vouchers etc. Meet the new hires to share the open positions & ask for referrals on day one and give on the spot awards. Have a double referral bonus for super niche skills where you may expect quick closures. How the referral process should be done and why? Familiarise the offered candidate with the referral policies so that they can refer even before they join and let them know that they’ll still be entitled to the benefits. Check in the organisation’s database to help the back office team map the Employee towards the ER bonus amount. It is a unique identification which can be implemented in small organizations and in large MNCs. It is essential to have more sessions, PPT etc. to motivate employees and to share the benefits to get more referrals. Know that people would never refer unless they are sure that their referral is being considered seriously hence be sure to communicate that. Realise that any type of Employee Engagement will have glitches and you will feel burdened when Employees speak to you. After reaching at a level, some HR’s think maintaining documentation isn’t their work so they avoid the task which is the incorrect approach. As Recruiters you need to realise that keeping documentation brings the change in an organisation which is not at all true. What to do Post Referrals? Once employees start referring candidates be sure to send the updates about their referral regularly. Give gifts or accessories like printed T – Shirts, Coffee Cups, Gift – Vouchers that are based on the number of references the person has given to the organisation which can be irrespective of selection. Gift customised gifts or accessories with branding such as printed T – Shirts, Coffee Cups, Bags, Pens, Bottles, Caps etc. Respective recruiters need to reach out to all the referrals and provide feedback on their candidature. Recruiters need to communicate the feedback to the Employees who have given a reference. Timely feedback helps build faith in the system but also ensures that the referrers keep pushing their referrals to get interviewed or join. One can try many programs but if there isn’t any proper feedback mechanism in place it will generate lesser ROI than expected. Referral Bonus is an important criterion for any referral activity but the feeling of helping a referral overrides it always. By no means is the RP going to replace other forms of hiring rather it is a reinforcement value system. If employees start viewing this as an additional source of earning; it would create a conflict of interest. Well you’ll be delighted to learn that we’ve covered all the aspects that were needed which will certainly help us in improving the present Referral system implemented. If you’ve found these insights helpful then you’ll also find Modern Recruiting Techniques used and its Challenges quite informative. In Today’s hyper – connected and competitive Talent Market it is essential for Talent Acquisitionists to stay updated with the Unique HR Practices Followed by Organisations to retain Talent. So how does one remain updated about the current HR practices? To which the answer is simple; by joining Recruitment groups like the Sourcing ADDA WhatsApp groups. Conduct employee engaging activities like Secret Friend for Friendship Day or similarly Secret Santa for Christmas but within the organisation. A creative image of new joiners and employees completing 3+ years can be displayed at the front desk and posted on Social Media. Conduct open house sessions once in every quarter to understand the problems, concerns of employees & sort out immediately. Have awards such as “Employee of the Month” with trophy & a cheque of Rs.10,000. Use good judgement when there are any meetings either Internal or with External entities like clients or vendors. Referral bonus is to be given to the offer accepted candidates based on the criteria being that both the candidates join and work for minimum 3 months.